But what does this all mean for us? Well the sun is in Libra with the moon in Aries both at 4 degrees. with a strong square to Pluto in Capricorn. The eclipse brings out our need to find balance between self and other, playing it safe and going for it, thinking vs doing. With mercury involved we may be trying real hard to figure it all out but that is not possible. Mercury is retrograde and connected to Neptune so the mind has to let go for anything to happen. We need to walk the tightrope of whatever intense events are occurring in our lives and not look down or hesitate for if we do we will probably fall. Move ahead with balance and grace is the energy of these signs together. Pluto squaring the eclipse will definitely make this a significant and intense period of time and add an extra edge of do or die to this eclipse. Total transformation of all that holds us back from ourselves, each other and moving forward is what is being asked of us. It is very important to feel grounded to work with this energy and luckily we have Saturn helping the eclipse energies find a steady balanced way forward. But Saturn won’t help unless we help ourselves first and do the work necessary to keep ourselves moving forward with balance and grace. Though this seems pretty heavy stuff and it certainly can feel that way there is a very creative and playful aspect to this chart as well. As I meditate on it I get the feeling that if we just ride this very big wave and don’t get to freaked out and just go with it we will find spontaneous creative solutions and it can actually be exciting and fun while taking us to new shores. Where this eclipse falls in your personal chart will show what you are moving forward towards and what is being asked to transform. 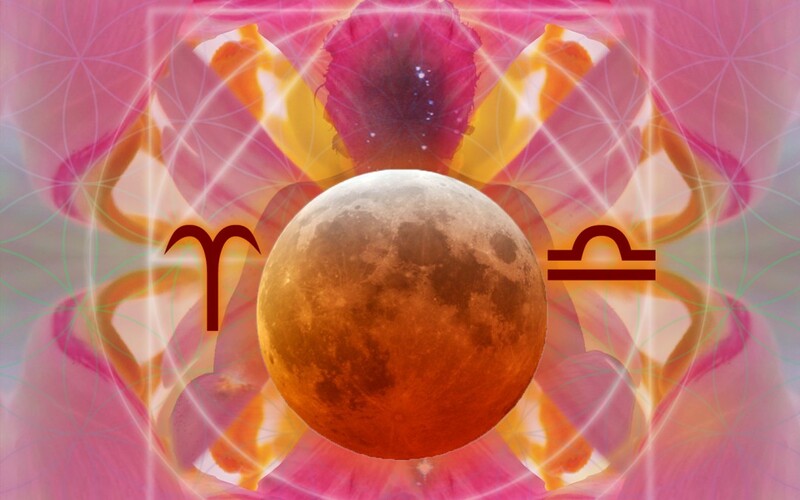 If you have significant planets near the eclipse degree of 4 libra/aries, basically the first half of all cardinal signs you are being strongly effected by this eclipse. The cardinal signs are. Libra, Aries, Capricorn and Cancer. It is a very powerful time to do deep inner transformations of your mental attitudes and how they affect your actions. This work and the insights that come from this can clear the way for major movement forward in your life over the next 6 months or so. Its not a time to act so much right now as it is a time to clear the path forward. Since mercury is also retrograde this will add a certain frustration to this time because the eclipse energy wants to explode forward but it is also being slowed down and asked to be directed inward by Mercury and Saturn. During an eclipse the veils between this world and the spirit world are extra thin and it is also a great time to tune in to spiritual help and guidance. Ask for help from your guides at this time to help you use these energies to supercharge your life for this is ultimately what can happen here. If you don’t feel connected to guides this would be a great time to ask for a connection. Somehow by fate I intuitively picked this day for my triple CD release party. The energies for me have been unbelievably intense. Physically, emotionally and spiritually. I have quite a few significant planets at this eclipse degree including Venus, Jupiter, Uranus and Chiron so in a way my life right now is a strong embodiment of what these energies are about. I have been using the energy as it builds to take my music and performance to a whole new level while facing many inner demons and emotions that have been holding me back, but until now I have never really been fully aware of. This has been difficult but a very powerful transformative process. Many issues of relationships can come with this eclipse. Especially for me the relationship of self verses other and finding balance with my relationship to my body and the earth, which is what these CDs are all about in the first place! Funny how it all comes round to a perfect completion. Speaking of completion the full moon is usually about completion of some sort or at least a culmination of things that have been seeded before at a new moon and in this case a former solar eclipse 6 months ago. This Lunar Eclipse is also the culmination of a series of 4 super moon eclipses and completes a much bigger cycle than any regular full moon. This Sunday for me will be a huge culmination of 3 years of work and in a way a lifetime of personal work. Learning to have a relationship with the Earth. To be here and honour my body and this planet. As someone very connected to spirit it has been very hard to feel comfortable in this body which has been full of dis-ease and suffering in this life. As one shaman teacher once told me I was born with my energy rooted in the stars and I would never feel totally comfortable rooting to the earth. Well that last part has been quite true but over the past few years I have found a powerful connection to the Earth which has been profoundly healing for me. As I tend to do, my journey gets expressed through song, and this led me to create the Earth Trilogy opus! I have found many ways to experience this connection to Earth and they are expressed in the widely varied musical styles on these 3 CDs. To experience the vibration of earth and feel a deep resonance with her; to open our hearts to Earth, honour her magic and feel her song; to build a healthier relationship with her. This journey has lead me through points of deep suffering where, to try and learn all that’s needed to create world class music in my little home studio, I pushed my body beyond what was healthy for me. Then I realized this was similar to how the corporate structure I so loath pushes the Earth and her resources beyond the limits of sustainability. This meant I actually was what I was fighting, this lead me to the true power of Ho’o’ponopono. This journey has been a long one and to culminate it on this eclipse was not planned. I just had a strong intuitive hit that the 27th was the day. Now I find the pressure cooker of this eclipse working on me and transforming deep places in my soul as I work toward it these building days. The last few days to keep this a healing process I began practicing sitting on a rock in the river behind my home. Just enjoying nature and the place that birthed several of these songs. The other day a hawk began whistling continuously above me and I was unsure if it really was a hawk it was so unusual. So I asked if I could see it and right away another hawk swooped through the trees right above my head and flew up to be with it, maybe in a nest. One of my main power animals is hawk so this was pretty strong medicine for me and to me relates directly to the energies of this eclipse.